This page is about the American jet fighter F9F-5. For other uses, see F9F (Family) and Panther (Family). The F9F-5 Panther is a rank V American naval jet fighter with a battle rating of 8.3 (AB/RB/SB). It was introduced in Update 1.33. The baseline Panther has very poor performance, losing a lot of speed in turns and having poor acceleration. Once the aircraft has been upgraded, it is a very powerful fighter. 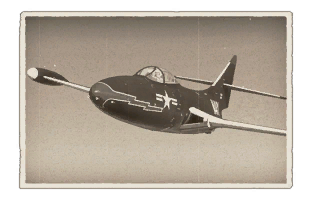 Its decent climb rate and 20mm guns make the aircraft best for Boom and Zoom tactics. The aircraft has a poor top speed, making it vulnerable to enemy F-86s and MiGs flying at higher altitudes. The Panther will typically find itself outclassed. However, it does excel in a support fighter role. Distracted opponents are easy prey when the Panther's high speed diving and maneuverability are applied correctly . When engaged 1 on 1 with other jet fighters, its flaws (low top speed) can be exposed. Defensively, the Panther has a uncanny ability to escape pursuing enemies when using its agility to your advantage. The Panther greatly excels at the Fighter-bomber role due to it's optional payloads. The primary modules that will need to be unlocked are flight performance, handling (New boosters), and offensive 20mm belts. After unlocking these high priority improvements, then the focus is secondary weaponry. Without the new 20mm Cannon module the plane tends to have a high spread when firing its primary armament. The Panther was born during a time when the jet engine was beginning to make its appearance into service. The United States Navy commissioned a jet-powered fighter for its carrier decks. Grumman began work on the XF9F-1 Prototype. The airframe would carry two crewman and implement four turbojet engines. At the time four of them were planned to be used due to the low power output by early turbojet engines. This ran into several issues including taking up too much space on American carriers. Eventually the design was dropped in favor of the XF9F-2 prototype that utilized 1 crew member and eventually a single engine. The British Rolls-Royce Nene turbojet engine was used for basic testing. Pratt & Whitney were eventually able to produce the engine and it was designated "J42". As the Panther moved along the creation process, items like wingtip fuel tanks were added to increase its range. Carrier trials with the prototypes were completed in March of 1949. The F9F-2 entered US Navy service in May of 1949. The Panther entered combat during the Korean War. It was the primary jet fighter used by the U.S. Navy and Marines. It played a significant part in the ground attack role and flew over 78,000 sorties. It secured the first U.S. Naval air to air kill against a Yak-9. Famous F9F pilots included astronaut John Glenn and Boston Red Sox player Ted Williams. Panthers were pulled from front-line service in 1956 in favor of the swept wing "Cougar". F9F Panther were the first jet used with the US Navy's Blue Angels aerobatic team. The F9F Panther was a fighter-bomber developed by the Grumman Aircraft Engineering Corporation and used during the Korean War by the US Navy and USMC. It was also the first aircraft used by the Navy's Blue Angels aerial demonstration team. The project started after World War II when Grumman proposed the XF9F-1 experimental aircraft (Grumman designation G75), a two-seat, four-engined aircraft for a contract to build a jet-powered night fighter for the US Navy. The company lost to the Douglas XF3D-1, but received funding to continue development of the XF9F. After jet technologies evolved to create engines with higher thrust, Grumman designed the Model G79, a single-engined day fighter. 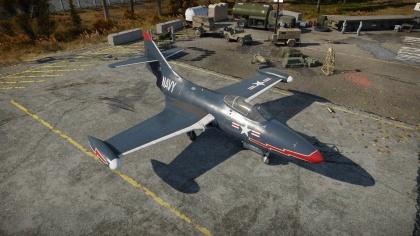 When the Navy realized the potential of this new design, they shifted funding towards the G79, which became the F9F Panther. Permanent fuel tanks were added to the wingtips to extend the range of the thirsty jet, but the added weight incidentally improved the aircraft's roll rate. The F9F-5 is the last and most produced variant of the Panther. It is a further development of the F9F-4, which lengthened the fuselage to carry more fuel. The F9F-5 was re-engined with the Pratt & Whitney J48 engine, a license-built version of the Rolls-Royce Tay engine. The Panther was later developed into the F9 Cougar, a swept-wing aircraft with significantly more thrust.